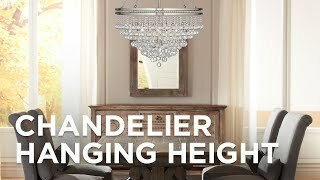 Transform your home with this beautiful chandelier. In a Castlewood Walnut and silver finish with crystal glass drops, this three-light mini chandelier design is a perfect way to welcome guests in foyers or entryways. 18 1/2" high x 13 3/4" wide. Round canopy is 5" wide. Weighs 10 lbs. Castlewood walnut brown metal frame with silver finish accents. Crystal glass drops. Minimum hang height of 21". Maximum hang height of 141 1/4". Because a home can never have enough crystal in it. It's the one that catches my eye, and it had good reviews. Perfect design and size for my master bathroom. Simple elegance! Perfect size to hang above my clawfoot tub! It was the right finish, the right size and the right price. No shipping and no tax is a great bonus! I cannot seem to locate the crystals that came with this chandelier. How do I order another set? What is the shortest length this can be installed? BEST ANSWER: Hi - This has an overall minimum hanging height of 21.5" and with a maximum overall hanging height of 92.5". can this light be directly wired? BEST ANSWER: Yes - this is a direct wire fixture. It must be directly wired. I don't know of an alternate installation method. How do you put crystals on? I see a bag of e and f crystals. I must have thrown away the instructions because I can’t find how they go on. BEST ANSWER: I have attached a link to the assembly instructions below. If you notice, some have a single smaller round crystal and double smaller round crystals above the larger teardrop crystal, if you look and enlarge the picture of this chandelier, you should be able to follow their placement. Hope this helps. Using the photo of the chandelier, just insert the appropriate crystal's tab into the hole positioned in each of the appropriate areas and crimp a bit to hold in place. Very easy to do, but time consuming. Can you hand this above a tub? BEST ANSWER: Yes, this light looks great over a tub because it has the proper scale to size. Yes. I have it in my kitchen, two of them actually above the breakfast bar. Yes it would be pretty. I guess I should have asked the question better, is this fixture approved for wet areas. Our local building department would require this if I want to install above a tub. Hi, this chandelier is not UL listed for Damp or Wet locations. Only Dry locations. 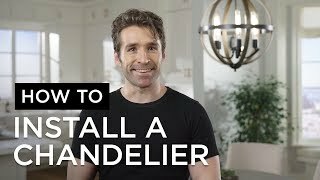 Do you have any chandeliers suitable for a bathroom ? BEST ANSWER: This is damp location rated and would be suitable for a bathroom. 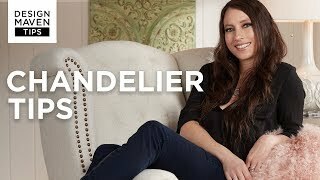 What is the diameter on this chandelier???? BEST ANSWER: Hi, the chandelier is 13.75" wide. Is it enough light for a nursery? I purchased this chandelier for above my dining room table and I love it. The crystals are elegant. You could adjust the brightness based on the bulbs you put in it. It's perfect for my large 12 person table so I am sure it would be plenty of light for a nursery. I purchased this for a client's hallway between master bedroom and bath. So I'm not living with it. My professional opinion is, is that you would need supplemental lighting in a nursery. Probably, with the correct wattage bulbs. We have it in a toilet closet, so not an easy answer. How to view in room? BEST ANSWER: Hi, we offer the "View in Your Room" feature online. Click on "View in Your Room" and upload an image of the room you want to see the chandelier displayed. I have it hanging in front of a 6 ft Mirror in the bedroom. Looks great! I want something that looks black. Does this look like walnut wood or more black? BEST ANSWER: This fixture is more towards brown. Please look at item 85093 on our website for a black finish. I have a 6" hole in the ceiling from a prior fixture. The base/canopy on this fixture is 5". Can a 6" base be used and can you supply that? BEST ANSWER: Unfortunately, we do not have a 6" inch wide canopy for this chandelier. Is the crystals already attached or do I have too assemble? BEST ANSWER: You have to attach them yourself. It's easy though. Doesn't take much time at all. Most chandeliers come without the crystals attached. 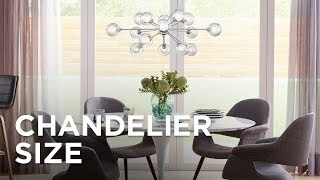 I love this chandelier, I bought two of them for over my breakfast bar in the kitchen. They really make the room pop. We had to attach the crystals. Sorry for the delay, as it went to my "other" email category (set up by Outlook, I guess). You have to attach them, which is fairly easy. It does not look as good in my house as it did in the shop - no rainbows. No, But takes very little time. Can I purchase additional chain? BEST ANSWER: Since additional chain is a special part order, you will need to call in to place your order and verify that we have stock. Please contact one of our customer service specialists for assistance and they will be happy to assist you! #83484 Can this be hung as a swag lamp?? BEST ANSWER: Yes, but it would look better to have an electrician move the electric rough and then hang. Is it hard wired only? I need a plug in one like this! BEST ANSWER: This mini-chandelier can be professionally converted to a plug-in fixture. You can also browse our selection of plug-in crystal chandeliers by clicking on the link below. This was hard wired - if you have a good electrician he might be able to convert it. This is a really nice fixture. Yes, it's hard wired only. is this chandelier bronze or silver? BEST ANSWER: Bronze, leafs have a silver color to them. 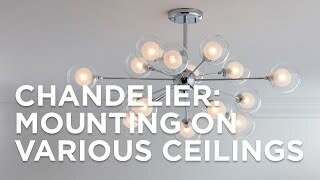 I hung this chandelier in my newly remodeled bathroom and absolutely love it! Very affordable and beautiful. I received the quaint chandelier as a gift for my mother's bedroom. Understated elegance yet enough light for reading. The size is perfect and she loves it. Very ornate. Looks great in my powder room! This is a perfect little chandelier! Great condition and well packaged. I have mine hanging over the kitchen sink to add a spash of glamour to our simple kitchen. The color blends perfectly with our cabinetry hardware and countertops. It was easy to assemble and hang and looks fantastic in front of the kitchen window. The light catches the crystals and they sparkle and send beautiful light throughout the room. Highly recommend this lighting fixture. I love this mini chandelier! The light arrived on time for Christmas. Mini chandelier is perfect size above my bathtub in master, it just had a few crystals missing. If used with a dimmer switch, any kind of mood can be created. We like this lamp but some of the parts were broken and we are still waiting to get two part replaced. Overall this lamp is very nice. I purchased three of these to line the ceiling of my antiques shop. They add a wonderful ambience and their small size adds elegance without being overwhelming. 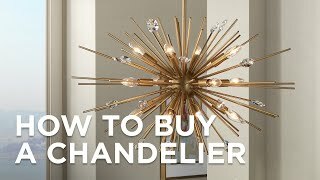 I would recommend the chandelier! I use the chandelier in the kitchen. Great addition to my gray/vintage kitchen. I bought two to hang over our kitchen island and they are beautiful. Perfect for my small dining area. Product was delivered to the Tukwila store in a very timely fashion. This is the perfect chandelier for a bedroom over the Master Bed. It was working fine, until we thought one bulb had burned out. My husband went to change the bulb, and has now discovered one arm has lost power completely and will require re-wiring. We will need to un-install the entire chandelier, including the decorative medallion, to correct the problem. This is just a time consuming annoyance, and I hope it can be corrected and is not a defective product. Unfortunate situation for us. I have this chandelier hanging over my bathtub, with a mirror behind it. The mirror makes the details show up. I also put a dimmer on it to control the amount of light wanted at any given time. Beautiful and it's the perfect size! Great light. It fits perfect in my house. 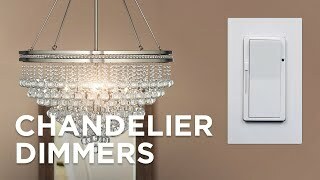 I love this chandelier and would highly recommend this product! It is not too big. We have installed it over our bathroom sink and it adds a bit of glamour and style to our small bathroom. It was packaged well and even had a few extra hanging pieces. This Mezzo glass mini-pendant features a rich Aston Court bronze finish sure to warm your traditional decor. Bring spot lighting to a nook or reading space with this charming three-light antique guild finish mini chandelier.